Click the links on the left to access different sections of the booklet, or DOWNLOAD a copy. You can also order copies by emailing us at info@safecarebc.ca. 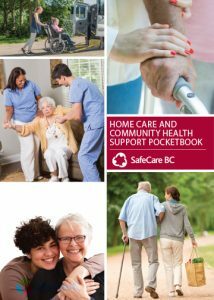 This resource for home care and community health support workers has been created to bring awareness to several health and safety issues faced in home and community care. As each workplace is unique, there is no single training resource that will address all the hazards that may occur in daily work.